As the Preschool Summer Campers dispersed among tables filled with rocks, minerals, magnifying glasses, dishes, paintbrushes, and water, they immediately began to inquire and connected their questioning and observations with the visit from a preschool science expert on rocks. One little boy brushed both sides of his rock and was amazed as he turned it over to see the split rock and the imprint and colors become more clear. He exclaimed, “Look, it’s the crystal, the geode!” The Preschool Nature Ramblers have been engaged in activities enriching their outdoor connections and building upon those extended periods of exploration and play since the very beginning of the summer. Searching, soaring, sifting, and surprising their counselors on a daily basis is what they have been doing. These active terms do not even begin to describe the level of outdoor exploration and play that the Preschool Nature Ramblers have enjoyed this summer. Taking off from the very beginning, the preschool campers have jumped into themes that allowed them to discover their senses and explore topics ranging from insects and soil to flight and rocks! 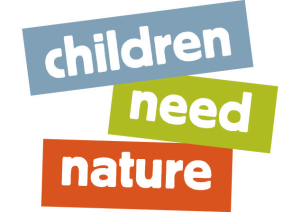 The trails, ponds, fields, and meadows naturally provide a workspace for the children to investigate through play and everyday interactions. For example, this week, the children have been drawn to digging and learning the components and makeup of soil. On a walk, the counselors and children used a soil corer to test the texture and examine soil in the forest, meadow, and near Cattail Pond. Their molding and squeezing techniques were put to work as they found soft clay near the pond and were able to compare it to the drier soil around the forest and meadow, made up of eroded rock, leaf litter, and other minerals. The children are intrinsically drawn to touch, smell, listen, and even sometimes taste to learn more, leading to new questions and a heightened curiosity about the bigger ecosystem that they are a part of. With this experience comes knowledge in the most honest way: recently, I had the opportunity to spend a few afternoons with the Tiny Toadlets, as we call our preschool campers. I was amazed to hear them discuss their collection of wineberries and their excitement in offering me some crackers with wineberry jam they had made. On another afternoon, I continued to hear about the different parts of soil; one father even came to me to comment on how his daughter taught him about humus, a layer of soil that he had not known about. 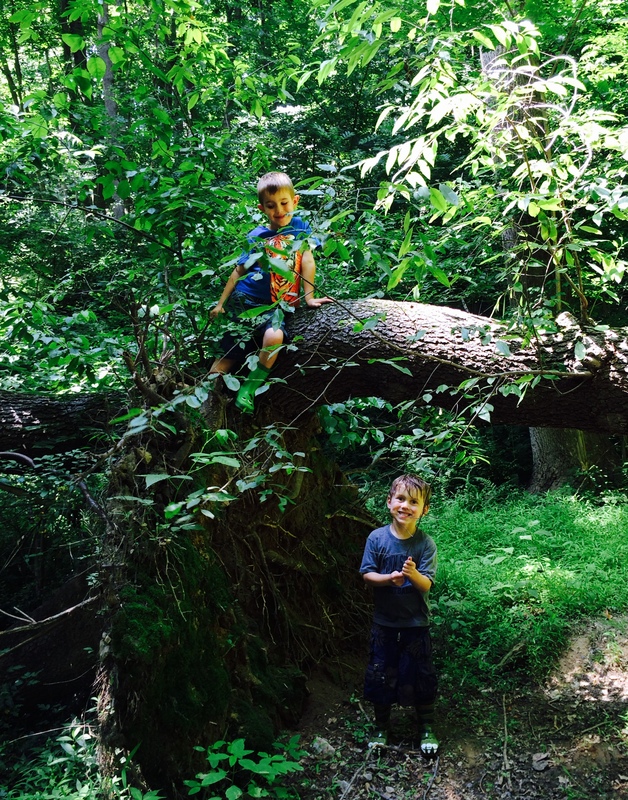 It just amazes me to hear how strongly the children connect with all of the parts of their world simply by going outside and just “being” outside in a mindful way. As the preschool manager and teacher during the school year, I watched the growth of a community from September to June as the children spent each day getting to know one another and the environment. This summer, with new children coming in each week, and others returning week after week, that spirit of togetherness has continued to build and deepen between the children. The shared experiences outdoors unify the group in a way that is unique and accepting to each child, allowing them to express their individuality and creativity. I love heading over to the Tiny Toadlets room around the end of the day to hear what their favorite activities were or see them sharing their beautiful art. Often, I break up the middle of my day to visit Tall Trees Playscape where the children will be discussing how they found an interesting caterpillar or got to climb on the biggest boulder that morning. It is these discoveries, which may seem small to some, that mean so much for these children. 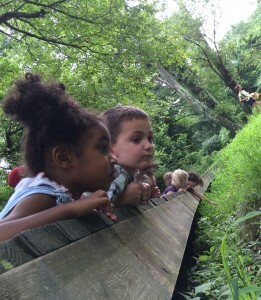 The preschool summer camp program has given the children invaluable opportunities to grow and learn alongside the natural world, letting them participate in the thinking process with the staff. Our preschool camp staff, Rebecca, Nicole, and Barbara each have a passion and distinct perspective on the world and show a willingness to delve deeper and challenge themselves as learners, mirroring the experiences of the children and strengthening the summer camp community. Their interactions bring joy and wonder to the children. Summer camp will soon be coming to an end, there are just a few more weeks. 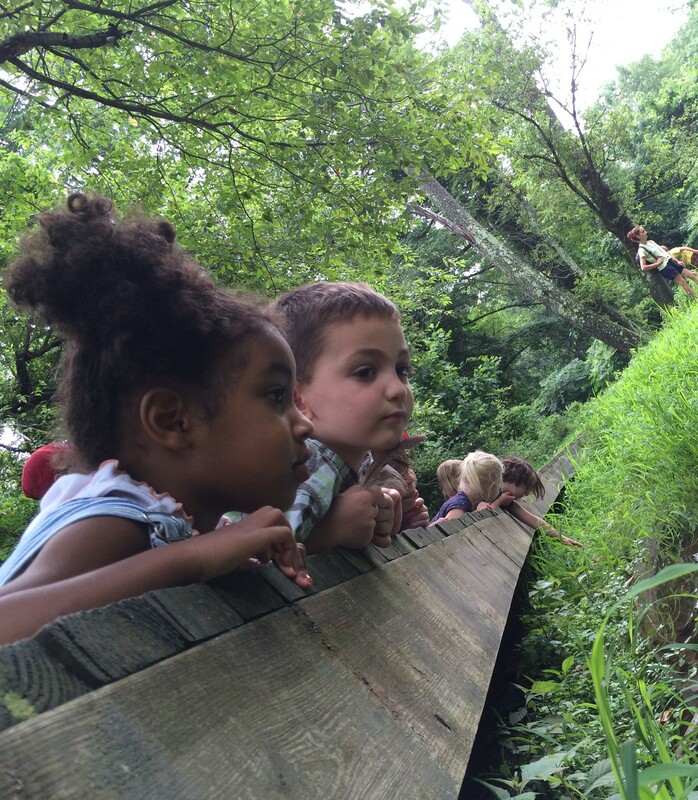 I am looking forward to seeing how the children continue to connect with nature and the Schuylkill Center, I know they’ll be able to do what they know best – play. 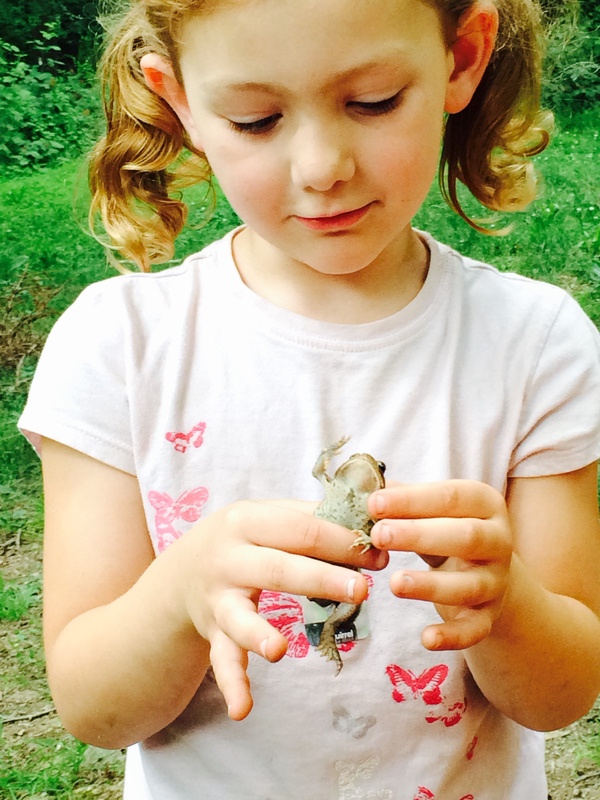 This is what brings joy to the children and to me and every moment I spend with the Tiny Toadlets at summer camp builds anticipation to spark children’s growth and curiosity this fall in our second year of Nature Preschool. The year will undoubtedly be filled with rubbing bark, peeling apart the layers of a tree, counting ants, climbing, digging, and more. I could not ask for a better place to accompany children on a ride of delight and triumph as they travel along their own paths, uncovering the secrets of the world. 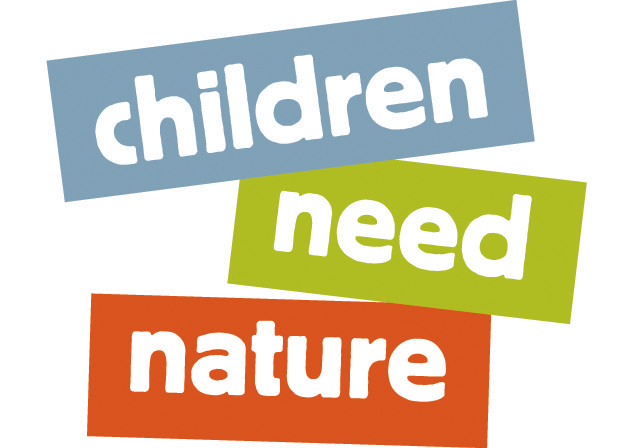 This entry was posted in Children Need Nature, Education, Nature Preschool and tagged Summer camp. Bookmark the permalink.